I can't believe Mr. Ben is in his 6th week of school already! He is so loving it and I just adore his class. For those of you who may not have read back a ways, per Ben, elephant = Peanut! So his real peanut-free classroom is safe, it's only decorated with plastic "Peanuts"! And I'm being rather lazy today. We had our dear friends over for the weekend, so I had to throw something together right before Ben had to leave for school, oops. However, he ate it all and was happy, so that's what counts. 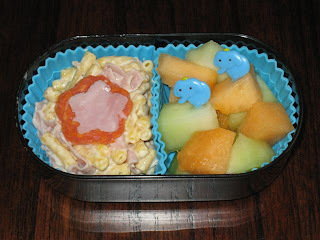 Ben had a pasta salad with ham strips and a couple of pepperoni & ham flowers (side note, thinly sliced deli ham doesn't cut up exceptionally well) and mixed melons with his Peanut picks. This would have been a perfect little bento lunch if there was more food. It's a very small Mickey Mouse box that is definitely snack sized. And if you haven't left your name to win a Diego box, you should! It's right here.